The Bruins faced a very tough task of taking down one of the best teams in the league on Thursday night in the Blackhawks. Entering the game, the Bruins had won one game against Calgary with new additions Lee Stempniak and John-Michael Liles in the lineup. This game would be a great benchmark for the Bruins to see where their game stands after being buyers at the deadline. Patrice Bergeron opened up scoring right away as he netted a goal just 1:18 into the first period. Then the Bruins awful PK happened. Jonathon Toews put in a power play goal after a nice feed across the crease by Andrew Ladd to tie the game at 1. But the Bruins did not stop the pressure. Brad Marchand netted his 33rd goal of the year, which now puts him at third in the NHL right behind Patrick Kane. Ryan Spooner picked up a power play goal and Loui Eriksson continues his solid season with his 24th goal of the season. Newly acquired Lee Stempniak and John-Michael Liles played a very good game against Chicago. Stempniak is starting to look very comfortable next to Bergeron and Marchand just two games into his Bruins career. He picked up his first two points as a Bruins on assists on Marchand and Bergerons goals. Liles picked up his first point as a Bruin on a very nice sauce pass to Loui Eriksson to finish the game for the Bruins. Beating a team like Chicago means a lot to the Bruins team. Chicago is one of the best teams in the NHL and when you play teams like this, it is a great measuring stick for your team to see where they stand. I totally get that the Hawks did not play their starting goaltender Corey Crawford, and I know he is one of the best in league, but the fact the Bruins were able to shut down the highest scoring line in the league was impressive. The Kane-Anisimov-Panarin has been wicked good this year. But, they had no answer the Patrice Bergeron’s line. Every time you would see Patrick Kane hop over the boards, Bergeron followed seconds later. It really showed that once playoff time comes again, Bergeron can shut down a good scoring line. I plan on seeing this against Washington with the Backstrom and Ovechkin line. There is no better bromance in the league than the one between Marchand and Bergeron, and I am willing to put money on that. The way these two embrace each other is straight up goals right there. Bergeron gets a lot of credit for his defense and wins Selkes every year which he deserves, but make no mistake Brad holds up in his own end as well. I am really looking forward to these two matching top lines in the playoffs once they come around. So for this game, I had a little extra riding on this game. One of my best friends Jacob is a die hard Blackhawks fan. So I am always kind of curious what some of the other fan bases think of us. Now, we all know what Montreal and New York think of us already and I know we do not have any kind words for them either but I will not get into that. For a team like Chicago that we only see twice a year, it is quite interesting to know what they think of Boston. So I did exactly that and sat down with Jacob to see what Chicago thinks of us. Question: After watching the game last night, how impressed were you with the Bruins shutting down the high scoring Patrick Kane line? Anytime you can shut down arguably the best line in the game in Panarin-Anisimov-Kane, you’ve done something special. 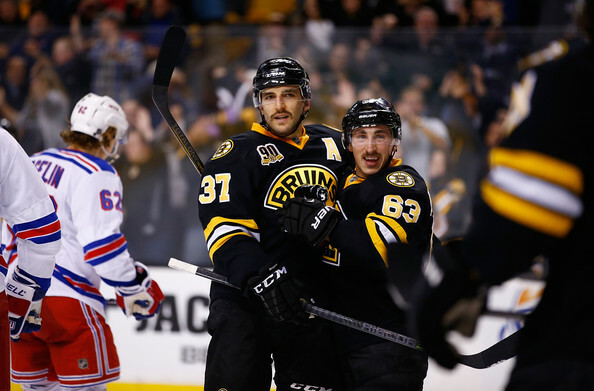 When you have a player as special as Bergeron, who is a two time Selke award winner, you are pretty lucky. He did a phenomenal job. Again, gaining votes for another Selke to add to his collection this year. Question: Everybody knows that Brad Marchand is not very liked by fan bases around the league. What are Chicago’s thought on Marchand? Honestly how can you not like him? Everyone wants a Marchand. When he came into the league, he got everyone’s attention. 2011 was the year he broke out when people started noticing not just his offensive production but just how good of a two way player he was. He carried that into the 2011 playoffs when they eventually on that year. I think people dislike him because they want him. Question: The Blackhawks currently look to be Stanley Cup bound themselves. If the Bruins make it to the Cup, what would you think of a Bruins-Blackhawks Stanley Cup again? That would be fantastic. I know Bruins fans haven’t forgotten 2013. I think it would be fun for the league. Both clubs have been there and done that. Very smart and well rounded organizations. Believe me, both can get there and want to get there and if that happens, be prepared for fireworks.